Monthly chart: there is a saved the upward trend here, but as you can see, the correction is possible to the supports of middle Bollinger bands with three frames - 1.3673 (weekly) - in the case of a strong uptrend, and 1.3230 (monthly) - in the case of bullish weakening front. 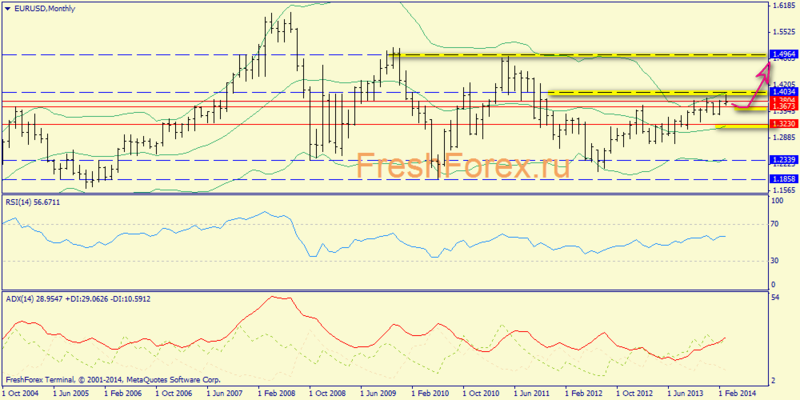 Break of 1.4034 resistance may lead to increased movement potential in the long term to 1.4954. Weekly chart: below 1.3673 bulls lose control because it will be formed bearish Over & Under (blue arrow). 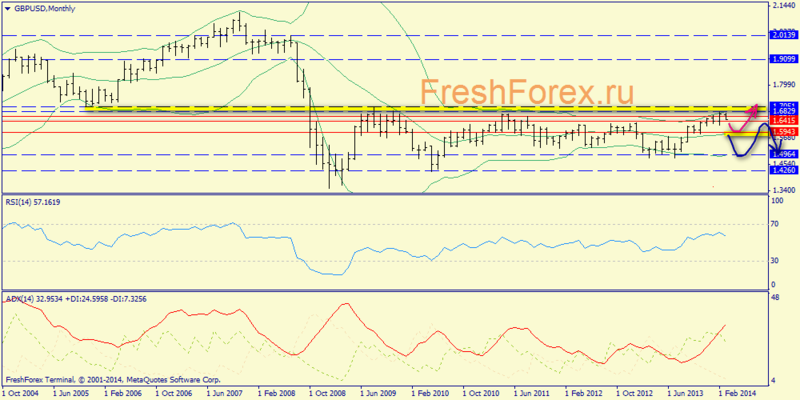 Therefore, the basic expectation is still a buyers ability to push for a new breakthrough from 1.3673. Day chart: also note the strong support area at 1.3673, there is the lower Bollinger band here. If the bulls will not start up from the current levels, I think very perspective levels for shopping in the 1.3673. Conclusion: Awaiting for the fall to 1.3673 and then growth in the 1.4054 area. There are 2 other opinions here. First is the scrapping of up-trend (it is enough to take away the price below 1.3673). In this case, you can wait for a correction in the 1.3915 area. It is a good idi to sell here at O & U pattern on the weekly chart. The second one - start up directly from current levels, right from the opening of markets. Monthly chart: upper Bollinger band (1.6829) is still quite intensively pushes the price down that, given only a week before the closing of the month, is fraught with a deeper correction to the 1.5943 - The scenario is described with red arrow. 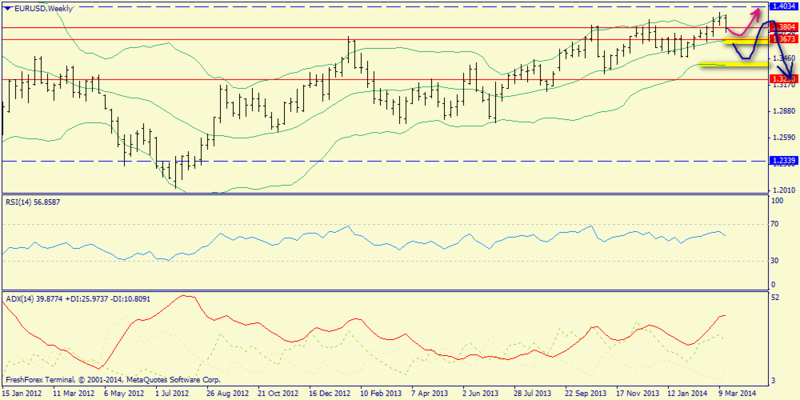 In case of leaving below 1.5943, the lower band (1.4964) will be attainable too. Weekly chart: here the situation is not beyond a technical correction (co-rotational movement down of ADX / RSI ligament), so the main scenario is a good splash from the price support 1.6415 (middle Bollinger band). In the case of leaving below 1.5945, it will be obtained by a reversal pattern Over & Under (curious synchronization with EURUSD week schedule), described with red arrow, in which it will be possible to sell from 1.6634. 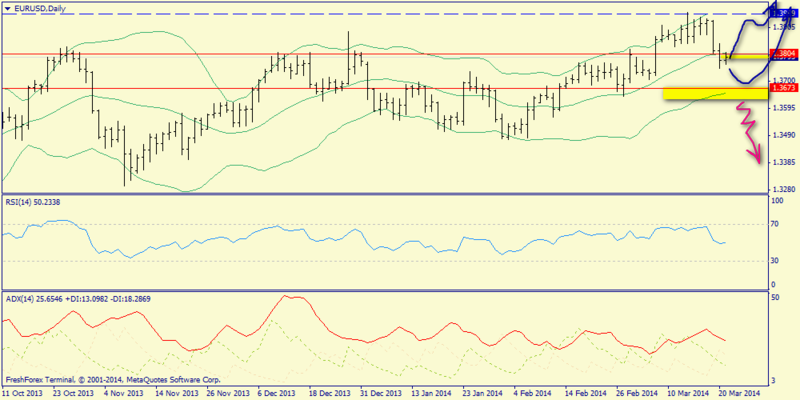 Daily chart: fourth bar outside Bollinger envelopes can also talk about approaching of upward correction. It confirms the support at 1.6415. Conclusion: The main opinion - touch 1.6415 and the growth to 1.6829, and in case of breakdown – to 1.7051. Another opinion is breakdown of 1.6415 and decrease to 1.5943. Monthly chart: there is a struggle for the continuation of the downtrend. Bulls still have one week to break the inner bar of February. And Bollinger envelopes are continued to actively decrease. Thus, scenarios of declining and the option to growth - equally. Weekly chart: we see that the bulls work out the significant convergence of the oscillator, so advantage of scenario with a turn becomes palpable. It should be allow one more movement down to the lower band (0.8617). The aim remains the same 0.9717. Daily chart: horizontal range, but with severe bull symptoms: broken the upper band and then received a boost from the middle (0.9016), so the main scenario finally secured north. Conclusion: The main opinion - an increase to 0.9717 (possibly after another removal prices down to 0.9812). The another opinion – decrease of the pair first to 0.8617, and in case of breakdown - to 0.8418.